Big Data Catalonia is an initiative that aims to identify all the companies and agents that are in the value chain of the data economy in Catalonia to create synergies and promote the country as one of the main sectors of activity in the sector to Europe. The initiative is promoted by the Center of Excellence in Big Data of Barcelona and the Digital Cluster of Catalonia, with the support of the Generalitat of Catalonia through SmartCatalonia. 11. For how many years do the data-based technologies and processes remain strategic in your organization? Data holders: These include holders of different type of data, from Public Sector Information (Government data) to scientific, business and sensor-provided data. In some cases these are owned by specific bodies, such as government or research organisations. Support Tools & Technologies: They cover all the support tools, tecnologies and infrastructures, commercial and open source, that act on a more infrastructural level (e.g. Hadoop on premises, cluster service etc.). The infrastructures are often provided by large vendors, they cover many of the specific functionalities. Marketplaces: Services where data are stored, curated and exchanged, it includes marketplaces. Analytics: Represents arguably the core sector of big data. It includes a wide variety of products such as Analytics platforms; Social analytics; BI; AI; Statistical computing; Machine learning; Visualisation; Unstructured data. Vertical apps: It includes analytical tools devoted to specific verticals such as marketing, legal , government, science, health, finance. Data Users: The final users of the data, once they have been elaborated by "data market" players. Any sector of the economy can benefit from "data based innovation" to derive economic and social benefits. For instance, the retail industry can better manage its logistics and thereby increase efficiency by analysing purchasing habits. It is well known that high-quality clients are a necessary factor for innovation to occur, and it is no different in the data economy. 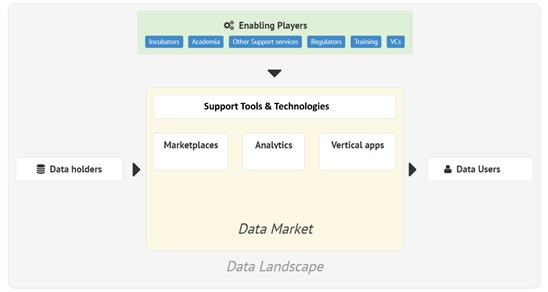 Enabling players: They include Venture Capitalists that provide risk funding to data start-ups; incubators that support their growth; research institutes that enable innovation; training organizations that provide the right skills; and public regulators such as the European Commission that can have a big influence on the development of the sector through for instance its data protection directives. **Only the data corresponding to the name, description, address and company website will be published. The other data will be used aggregated for statistical purposes. ** Includes venture capital companies that provide risk-setting funds for data creation; incubators that support their growth; research institutes that allow innovation; training organizations that provide the appropriate competencies; and public regulators like the European Commission that can have a great influence on the development of the sector through, for example, its data protection guidelines. *** Workers whose main function is related to the acquisition, management, analysis, exploitation or data strategy. 14. What do you think are the main problems that the company faces in relation to the use and exploitation of data? Your personal data are part of the database of Eurecat with the aim of inform you about our activities and others that may be of your interest. Also, the data corresponding to the name, description, address and website may be published to form part of the ecosystem of Big Data Catalonia. Eurecat adopts technical and organisational measures to prevent any tampering, loss or unauthorised access and to enforce the regulation of security measures. You may revoke the consent given at any time, as well as exercise your rights of access, rectification, cancellation and opposition by sending an email to: baixes@eurecat.org indicating “Baja” at the subject of your email. All this in is compliance with the provisions of Organic Law 15/99 of 13 December regarding Personal Data Protection, in accordance with the developing regulation approved by Royal Decree 1720/2007 of 21 December. 13. What are your organization's priorities in the field of data? 14. Does your company have a data center on-premise or in the cloud? 16. What do you think are the main problems that the company faces in relation to the use and exploitation of data? 17. Do you give permission to contact you to participate in a study on the impact of Big Data on the operating results of companies? Eurecat adopts technical and organisational measures to prevent any tampering, loss or unauthorised access and to enforce the regulation of security measures. You may revoke the consent given at any time, as well as exercise your rights of access, rectification, cancellation and opposition by sending an email to: baixes@eurecat.orgindicating “Baja” at the subject of your email. All this in is compliance with the provisions of Organic Law 15/99 of 13 December regarding Personal Data Protection, in accordance with the developing regulation approved by Royal Decree 1720/2007 of 21 December. 15. Does your company have a data center on-premise or in the cloud? 18. What do you think are the main problems that the company faces in relation to the use and exploitation of data? 19. Do you give permission to contact you later to participate in a study on the impact of Big Data on the operating results of companies? 15. Which of the following areas are the services / products offered by the company (1 not important to 5 very important)? 17. What do you think are the main problems that the company faces in relation to the use and exploitation of data? Your personal data are part of the database of Eurecat with the aim of inform you about our activities and others that may be of your interest. Also, the data corresponding to the name, description, address and website may be published to form part of the ecosystem of Big Data Catalonia. Eurecat adopts technical and organisational measures to prevent any tampering, loss or unauthorised access and to enforce the regulation of security measures. You may revoke the consent given at any time, as well as exercise your rights of access, rectification, cancellation and opposition by sending an email to: baixes@eurecat.orgindicating “Baja” at the subject of your email. All this in is compliance with the provisions of Organic Law 15/99 of 13 December regarding Personal Data Protection, in accordance with the developing regulation approved by Royal Decree 1720/2007 of 21 December.